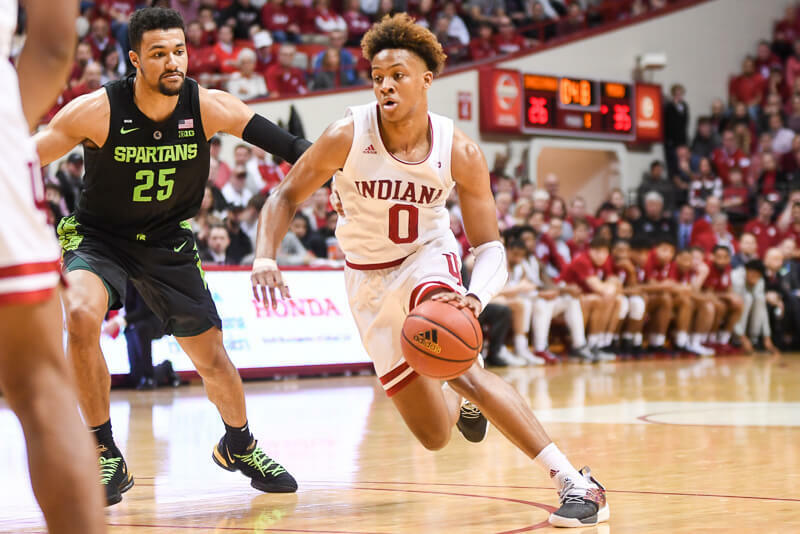 As a freshman in Tom Crean’s first year as coach (2008-09), he recorded a double-double in the team’s first two contests of the season — a first ever by an Indiana freshman. By year’s end, the Ohio native started all 31 games with averages of 9.7 points and 6.4 rebounds per game, and seemed primed to continue to be an offensive threat as his career continued. But as Pritchard succeeded on an individual level as a freshman, the team struggled. And those struggles continued during his sophomore and junior seasons, ones in which he found his role decreasing. He could have left for another program. Remember: Kelvin Sampson recruited him to Bloomington, not Crean. But Pritchard stuck it out, accepted his new role, and is now an important part of the Hoosiers’ surprising 23-7 season. Pritchard will likely play in his first NCAA tournament later this month, perhaps not always something he envisioned during the team’s darkest days. Sunday’s senior day is a reminder how far Pritchard has come, and how much he has sacrificed for the good of the team. To understand the bruiser you see on the court now, though, you must first understand his journey to get there. It looked easy for Pritchard at first. Those double-doubles in his first two collegiate games were both Indiana wins. There was plenty of talk of his potential and how good he could become as he matured in the program. 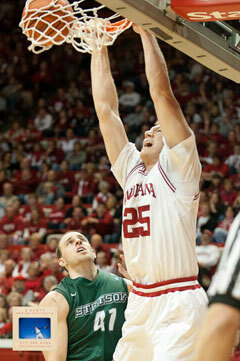 But the Hoosiers began dropping games to teams like Northeastern and Lipscomb. They went 1-17 in the Big Ten. It didn’t matter that Pritchard was putting up 16 points and 11 rebounds against Ohio State – the program known for its winning, well, wasn’t. And interest in Pritchard and the Hoosiers bottomed out. And it didn’t figure to get better anytime soon. The Hoosiers had hometown Mr. Basketball Jordan Hulls coming in, along with top 50 players Maurice Creek and Christian Watford, but those players would need time to develop. Indiana still needed Pritchard to play a leading role, but he couldn’t. He was a role player forced to be something more, and he struggled with it. His numbers tailed off as the Hoosiers struggled through a 10-21 season, going 4-14 in conference play. He scored in double figures only three times all year, and he began to lose the potential tag he was given as a freshman. Things weren’t so easy for Pritchard anymore. How he saw that light, though, is hard to understand. The Hoosiers had one of the worst-rated recruiting classes in the conference, with only Will Sheehey and Victor Oladipo joining the team. Neither player was rated in the top 100 nationally. How could Pritchard possibly have known the wins were going to come? Progress came slowly. Crean and the Hoosiers were given a pass by fans during the first two years of struggles. Crean inherited one of the worst possible situations, after all, and Indiana supporters understood it would take time. The third year was different. Fans wanted to see improvement, and it just wasn’t there. The Hoosiers went from four Big Ten wins to three, and went 12-20 on the season. Few felt the effects of the struggles more than Pritchard. With the team losing, fans looked for someone to blame. Pritchard was an easy target. The once promising player was now averaging only 2.5 points per game, and he heard some boos. Pritchard always seemed to be a step slow. He could rarely go two or three minutes without picking up multiple fouls. Pritchard committed the most fouls on the team in both his sophomore and junior seasons, even though he was playing fewer than 20 minutes per game. Senior Kory Barnett doesn’t think the criticism was fair. Pritchard’s drop off in production wasn’t all that surprising to Barnett because Pritchard wasn’t used to his role. He played on the perimeter and shot jumpers in high school, and he couldn’t do that for the Hoosiers. Pritchard had to play inside. They didn’t have anybody else. Pritchard just kept grinding. He ignored the hate by refusing to read newspapers, and he spent his summer in the gym. 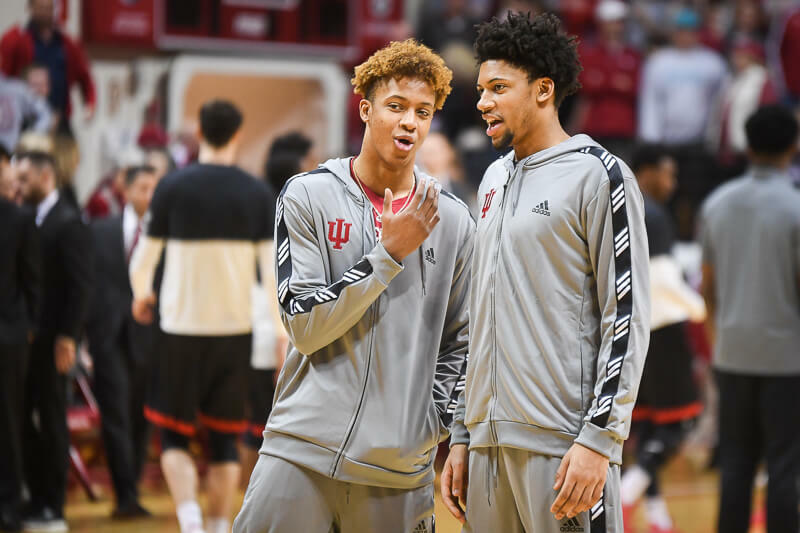 Highly-touted recruit Cody Zeller joined the Hoosiers for offseason workouts, and Pritchard did what he could to prepare the freshman for Big Ten competition. Zeller figured to start from day one, pushing Pritchard to the bench. Some players would have felt disrespected. A freshman starting over a senior? After all Pritchard had been through? Pritchard didn’t look at it that way. He saw Zeller as the nation’s next great big man, and he wanted to do what he could to get him ready. “He’s provided everything for us,” Prichard said of Zeller. “He’s been a dominant presence inside, and that’s something we really needed. Pritchard’s current role for the Hoosiers is miles from the one he played when he arrived in Bloomington. He comes off the bench to spell Zeller, with a job description consisting of defense, rebounding and setting strong ball screens for Indiana’s perimeter scoring threats. He’s playing only 10 minutes per game and is averaging just 1.4 points, but he’s been a vital piece to the Hoosiers’ success. “Every single huddle, Tom’s always got something to say,” Barnett said. “He’s a great leader because he’s been through so much. He’s been through it all, so he’s able to tell people different things. He’s felt the strength of some of the strongest guys in the Big Ten, so to be able to body with Cody in practice and show him how it’s gonna be has been special for us. 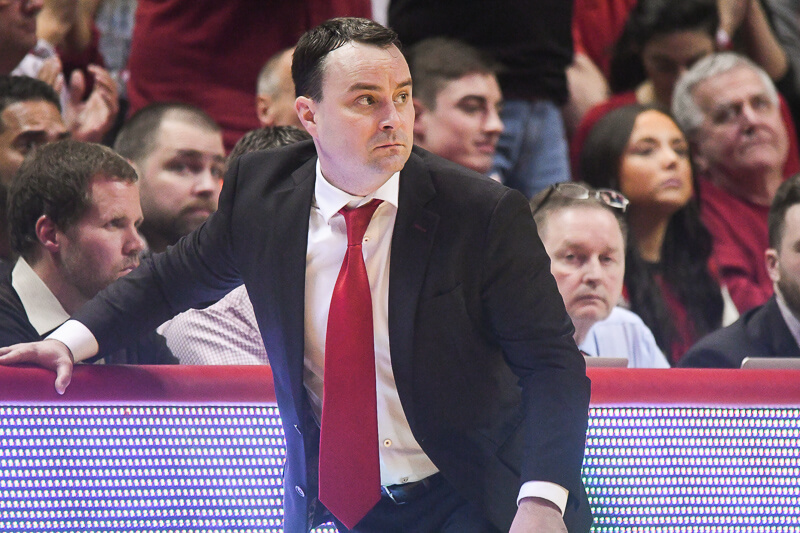 After he was treated as a scapegoat last year, Pritchard seemed unlikely to ever win the approval of Indiana fans. But Pritchard has become something of a fan favorite this season. When he enters the game, he usually receives a loud cheer. When he catches the ball, the student section yells for him to shoot it. And when he exits, Pritchard almost always gets a standing ovation for his effort. In a game against Illinois on Feb. 9, Pritchard caught the ball near the 3-point line on the left wing. “I caught the ball for a 3, and everyone was like going crazy,” Pritchard said, laughing. “I think if I shot a 3, I’d probably come straight out from coach. Pritchard honored his commitment to Indiana, even when he knew the cupboard would be bare. But others didn’t. Devin Ebanks, currently of the Los Angeles Lakers, backed out and went to West Virginia instead. Terrell Holloway chose to go to Xavier. Don’t think Pritchard forgets about those two. A reporter asked Pritchard how the program would be different if Ebanks and Holloway would have honored their commitments. “Have you thought about if Ebanks and I forget the other one’s name,” the reporter said. “Have you thought about how things would have been different if those two had come?,” the reporter asked. It’s a great story because of the five seniors that joined a program nobody wanted anything to do with. It’s a great story because there would be no 23-7 records without the guys who suffered through the first 6-25 season. It’s a great story because of guys like Pritchard, who seemingly progressed in reverse – from starter to coming off the bench, from scorer to role player. “He’s kind of the epitome of all of us,” Barnett said. Pritchard will play at Assembly Hall for the final time Sunday night when the Hoosiers close the regular season against Purdue. When Pritchard takes the microphone to deliver his senior speech after the game, it promises to be memorable. This is the same kid, after all, that posted a photo of himself Tebowing after his last final exam of the first semester. Pritchard won’t be Bradying on Sunday because he’s sick and tired of sitting with his head down after loss. He’s had plenty of opportunities for that during his four years in Bloomington. When Pritchard walks out of Assembly Hall after playing the Boilermakers, he plans to do it with his head held high. He’s not looking back at the struggles – he’s looking forward to what’s still to come. Makes no difference if man, woman or child. When those seniors are honored tomorow night, it should bring a tear from the eye of every true Hooiser. What a special group of young men. They’ve walked through a valley that very few, if any, in sports have ever experienced. And they endured! It’s a testimonial to their perseverence, and more so to their character. As a faithful Hoosier, I say thank you. I’m proud of you for the person you are. How much America is in need of leaders such as you. Technically you could say every four-year player since 69-70 has made the tournament, because those who were freshmen that season made it in 73. Spoken with neither a shred of shame or irony. That’s great guys. I wasn’t energetic enough to look it up but isn’t it cool that this group of seniors stuck it out and put in the work to keep that streak going and see the fruits of their labors? Why isn’t there one about Roth? He was a factor in IU basketball! Thanks TP for all of your efforts! Maybe he should just give in to the refs and foul out of his last game 🙂 Putting DJ Byrd on the floor 5 times would be fine with me. marcus, freshmen weren’t allowed to play on the varsity teams until the 72-73 season, so there weren’t any four-year players before that. With all the freshmen phenoms we have today (and a few then, too), it’s hard today to imagine freshmen not playing, isn’t it? I love Tom Pritchard. Yeah, we expected too much from him during The Darkness. But I don’t think anyone can question his love for the university and his commitment to play hard on every possession. I’m hoping he fouls out today, getting his fifth by knocking down two Boilermakers after a put-back jam! That would be a most awesome and fitting way for him to leave Assembly Hall.